Imagine if your cell phone had a transparent screen that you could stretch to twice its normal size so you could see bigger pictures and have a bigger space to type on. It's a scenario that could one day be a reality, according to scientists at the University of California, Los Angeles. Researchers at UCLA's Henry Samueli School of Engineering and Applied Science reported this week that they have created a light-emitting electronic display that can be stretched, folded and twisted, while remaining lit and snapping back into its original shape. OLED technology is used today in smartphones and even some televisions. The new stretchable material could change the form of smartphones and could lead to wallpaper-like lighting, minimally invasive medical tools and clothing with electronics integrated into them. "Our new material is the building block for fully stretchable electronics for consumer devices," said Qibing Pei, a UCLA professor of materials science and engineering and principal investigator on the research. "Along with the development of stretchable thin-film transistors, we believe that fully stretchable interactive OLED displays that are as thin as wallpaper will be achieved in the near future. And this will give creative electronics designers new dimensions to exploit." The new material is a single layer of an electro-luminescent polymer blend sandwiched between a pair of new transparent elastic composite electrodes, according to UCLA. These electrodes are made of silver nanowires inlaid into a rubbery polymer, which allows the device to be used at room temperatures. The university also reported that, during testing, the material was stretched 1,000 times, extending it 30% beyond its original shape and size, and it still continued to work at a "high efficiency." The material also could be stretched to more than twice its original size and remain functional. It reportedly also can be folded at a 180-degree angle and twisted in multiple directions. This could be a useful invention for the electronics industry, said Dan Olds, an analyst with The Gabriel Consulting Group. 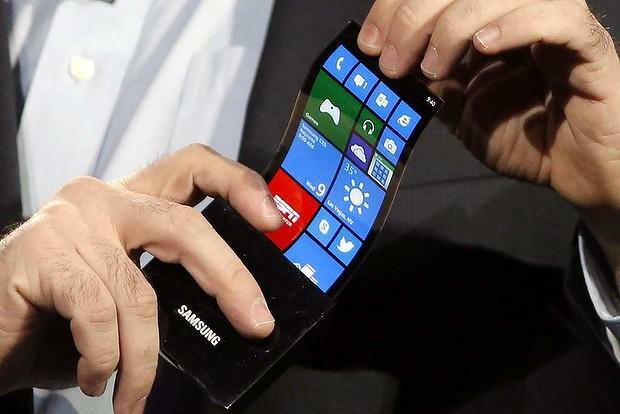 "The stretchable and bendable screen is a big step into a world we've only seen via science fiction movies so far," said Olds. "This is a world where information is displayed on surfaces that move and morph to accommodate the situation. While the reality probably won't be quite as slick as what we see at the cineplex, UCLA's work is a sign of what's coming." He added that there are many unanswered questions, such as how image quality will be affected at different sizes and the material's durability. "Questions like that are natural when a technology is this young," he said. "There is quite a bit of competing research in this space these days, with many labs and commercial companies working on these same concepts. I'd expect to see a lot more of these announcements and demonstrations in the coming months. But I wouldn't expect to see commercial products for a couple of years." This article, Research may lead to stretchable, bendable smartphones, was originally published at Computerworld.com.